This Field Report includes information submitted by KHRG researchers describing events occurring in Nyaunglebin District between January and December 2013. It describes different human rights violations and other issues important to the local community, including land confiscation, arbitrary taxation, forced labour, restrictions on the freedom of movement, arbitrary arrest and detention, landmine incidents and militarisation. One of the primary concerns raised to KHRG by villagers regarded the confiscation of land for resource extraction and commercial rubber plantation projects, in Shwegyin and Kyaukkyi townships in particular. Villagers reported that these projects have a negative impact on their livelihoods, the surrounding environment and their ability to travel freely. In Mone Township, landmine incidents continued to be a concern for villagers. 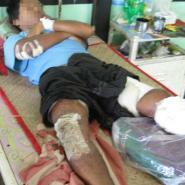 Five landmine incidents occurred in the early part of 2013, seriously wounding villagers. In 2013, KHRG continued to receive reports from villagers in Nyaunglebin District regarding land confiscation for resource extraction and commercial agricultural projects. 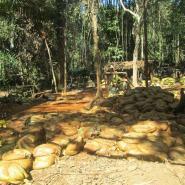 This trend is particularly visible in Shwegyin and Kyaukkyi townships, where rubber plantations and gold mining projects are increasingly being planned and implemented. Villagers in these townships identified land confiscation and the subsequent negative effects on sustainable livelihoods and on their freedom of movement as one of the primary difficulties they faced. 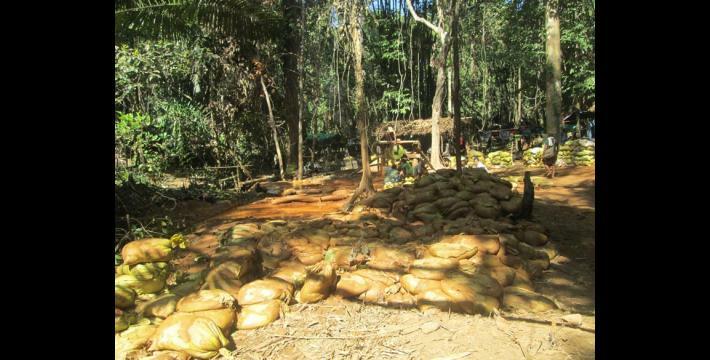 Confiscated lands in those townships include villagers’ plantations, residential farmlands and deep forest areas, land which villagers often rely on for their sole means of livelihood. Marked as uncultivated by the Burma/Myanmar government, wealthy entrepreneurs and businessmen are able to buy this land by demarcating their desired area on the Burma/Myanmar’s government map for commercial rubber plantation and mining projects. Although these commercial projects are subject to approval by the Burma/Myanmar government, little to no investigations in these areas are conducted, which often results in many cases of land confiscation. This is evident in Shwegyin and Kyaukkyi townships, where villagers raised their concerns to KHRG regarding the sale of 18,400 acres of land to three private businessmen by the Burma/Myanmar government. Much of this land belonged to villagers and was converted into commercial rubber plantations or used for gold mining projects. 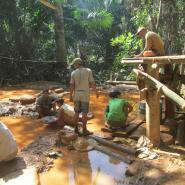 Villagers also reported to KHRG their worry over gold mining projects in Kyaukkyi, Shewgyin and Mone townships. Gold mining can be particularly environmentally destructive, as harmful chemicals are often used in the extraction process. One such method is cyanidation, where piles of crushed ore are dissolved by pouring a cyanide solution over it, allowing the gold to ‘leach’ out. However, this process risks contaminating the surrounding area as cyanide seeps into the ground, and it is heavily regulated by many countries. Villagers are concerned about the potential for environmental damage due to such methods, fearing it will pollute drinking water in the region. 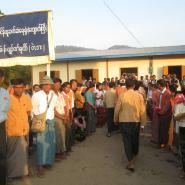 In 2013, KHRG received several reports of arbitrary taxation by Tatmadaw soldiers in Nyaunglebin District. 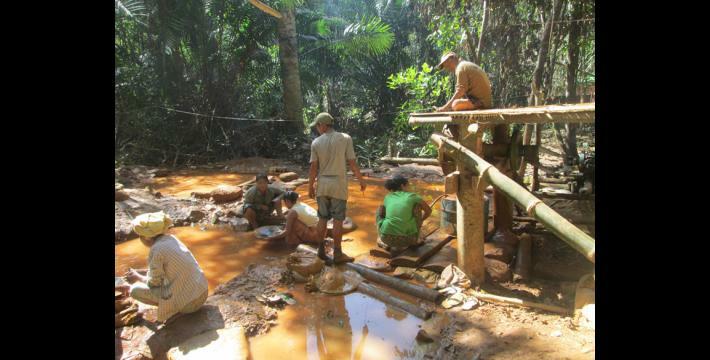 In Kyaukkyi and Shwegyin townships, Tatmadaw Light Infantry Battalion (LIB) #264 Battalion Commander Kyaw Myo Oo demanded 350,000 kyat (US $358.98) each month from 50 owners of gold mining machines. On June 10th 2013, villagers from Ma La Daw village, Mone Township, were collecting firewood from outside of their village when they were stopped by Tatmadaw LIB #264, who had rotated to Mone Township from Kyaukkyi and Shwegyin townships. The new commander, Ye Myint Thu, and his soldiers had been waiting for the villagers to return and demanded 10,000 kyat (US $10.26) from each oxcart in order to pass. Villagers reported that although they did not want to pay the tax, they had to because they feared the Tatmadaw and their weapons. In 2013, villagers in Kyaukkyi and Mone townships were still subject to forced labour ordered by Tatmadaw soldiers. In Kyaukkyi Township in February 2013, eight villages were ordered by Tatmadaw LIB #349 Commander Paing Soe Hkaing to construct perimeter fencing around the Tatmadaw Kyone Kyi army camp without providing any payment for their labour. Each of the eight villages were assigned 25 cubits (1,142.50 cm. or 450 in.) of land to fence and were allowed to determine how many villagers to send in order to meet Commander Paing Soe Hkaing’s demands. In the same month, in Mone Township on February 11th 2013, Tatmadaw Infantry Battalion (IB) #30 and LIB #590 based at Htee Ler Baw Hta army camp demanded villagers from Myaw Oo and Htee Toh Loh villages transport rations and weapons using a total of 58 of the villagers’ carts. The villagers were not provided with compensation for their labour. On the same day, Battalion Deputy Commander Aung Naing Htway from LIB #590 demanded villagers from Ma La Daw village transport rations to Ma La Daw army camp. Villagers in Nyaunglebin District raised concerns to KHRG relating to their freedom of movement. Villagers reported being required to obtain travel documents provided by the Tatmadaw in order to move within Nyaunglebin District and that Tatmadaw soldiers continued to question villagers and demand to see recommendation letters when they travelled. Villagers also raised their concern about the ceasefire and their insecurity about travelling and transporting goods in their area. In January of 2013, 30 Tatmadaw soldiers led by two unknown army officers from Htee Ler Baw Hta army camp came to Htee Lay and Ler Taw Tha villages and questioned villagers transporting goods. Villagers reported feeling intimidated by the soldiers and avoided travel at that time. Villagers also reported feeling restricted in their freedom of movement due to the continuing existence of landmines in Nyaunglebin District. 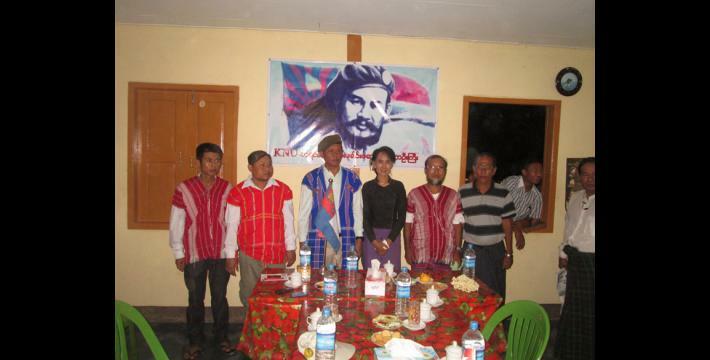 KHRG received one report of arbitrary arrest and detention by the Tatmadaw in Nyaunglebin District in 2013. On March 25th 2013, Strategic Operations Command (SOC) #8 Commander Aung Kyaw Kay detained and questioned a villager in Hsaw Mee Loo military camp when the villager was returning from Toungoo town to visit his family in Muh Theh village. He was released the next day on March 26th 2013. Landmines continue to be a concern for villagers in Nyaunglebin District. KHRG received five landmine incident reports in 2013, all from Mone Township. Villagers are unsure which armed actors are responsible for planting the landmines, or when they were planted. Both the Tatmadaw and KNLA have been active in Mone Township during 2013, despite the signing of a preliminary ceasefire agreement in 2012, and there is evidence to suggest that in at least two cases the landmines had been planted recently. 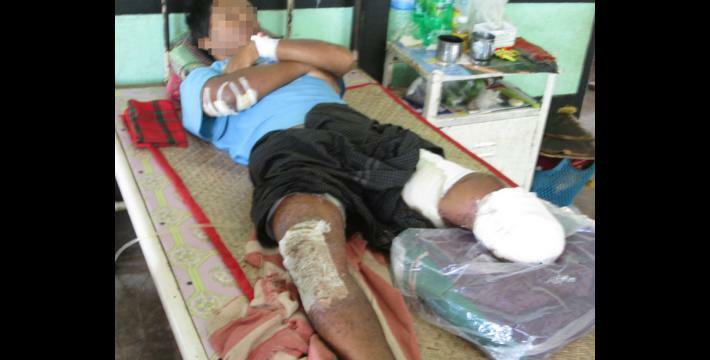 On February 2nd 2013, a 22-year-old male from Nga Lauk Tet village was walking home after collecting firewood in Maw Lay Forest when he stepped on a landmine, sustaining temporary injuries to his leg. Less than two weeks later, on February 13th 2013, an 18-year-old male from Kyun Pin Seik village struck a landmine in Pa Dat Kone area with his cart while on his way to work. He was sent to the Mone Township hospital after he was hit. Again, on March 2nd 2013, a 25-year-old male from Meh Meh Su village was hit by a landmine while looking for vegetables near Meh Pok village. The villager lost his right leg in the blast. 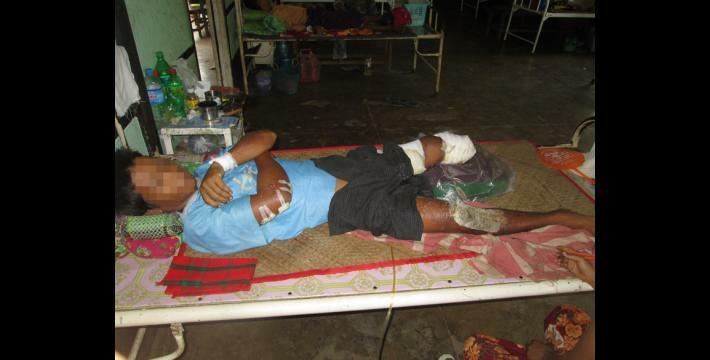 On April 20th 2013, a 23-year-old male from Mee Taing Taw village stepped on a landmine while looking for firewood one mile from Kyuang Su village, which is in Kyi La Myaung region. The villager was sent to the Mone Township hospital where his left leg was amputated. Finally, on June 1st 2013, 45-year-old male stepped on a landmine in Chauck Kway area causing major damage to his left leg, resulting in its amputation. In both the February 2nd and June 1st incidents, the landmines detonated on frequently used paths, indicating that the mines were likely to have been planted recently. On January 20th 2013, Daw Aung San Suu Kyi and several of her colleagues from the National League for Democracy (NLD) visited Kyaukkyi town and Mone town to visit disabled civilians, including those injured by landmines. Her people also distributed mosquito nets in Aung Chan Tha, Myaw Oo and Paw Pee Der villages. 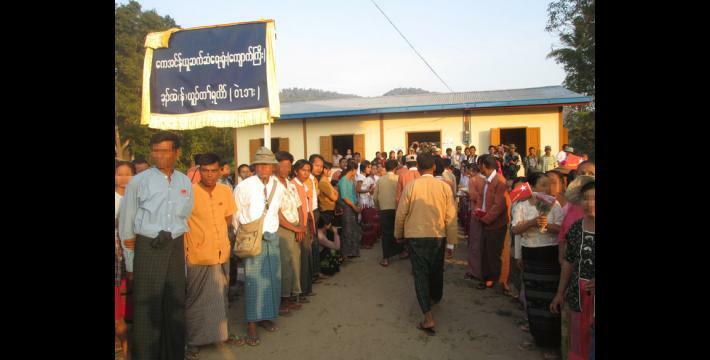 On August 7th 2013, the Burma/Myanmar government announced they will start collecting statistics on militia recruitment registration, which had been carried out in 2008 at the village tract [level]. 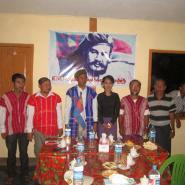 They are recruiting ten active Tatmadaw militias and 20 reserve militias. A total of five village tracts in Kyaukkyi Township complied with the order. This information was included in an unpublished Situation Update report submitted to KHRG by a community member in Nyaunglebin District. See “Nyaunglebin Situation Update: Kyauk Kyi Township, February to April 2013,” KHRG, December 2013. All conversion estimates for the Kyat in this report are based on the September 5th 2014 official market rate of 974.99 kyat to the US $1. See “Forced labour in Nyaunglebin District, February 2013,” KHRG, October 2013. This information was included in two unpublished Situation Update reports submitted to KHRG by a community member in Nyaunglebin District. Strategic Operations Command groups are usually comprised of three to four battalions and a Headquarters. They generally cover an area for defensive purposes, rather than offensive operations. 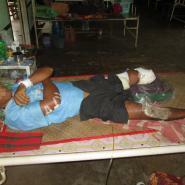 See “Nyaunglebin Situation Update: Kyauk Kyi Township, February to April 2013,” KHRG, December 2013 and “Landmine injuries in Mone Township, Nyaunglebin District since January 2013,” KHRG, July 2013.